In this post i will show you how to display the workflow history log in the workflow status column instead of just “In Progress” or “Completed”. I think that is to complicated! Of course it is fully clickable, and takes you right to the good old workflow status page. The code for the file “WorkflowHistoryInListView.js” is supplied below. The scripts “interaction.js” and stringBuffer.js” is created by Erucy and published on codeplex – you can find them here. You could also use WfListGuid = “Workflow History”; for a english language site – but remember that the displayname of your workflow history list will change depending of your site’s language. I personally always use list GUID. Note! 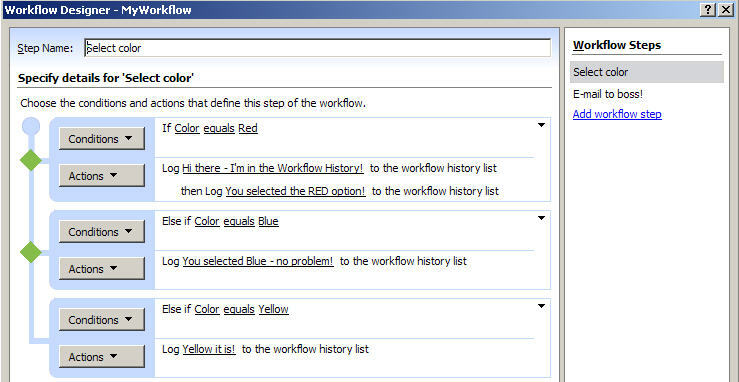 The workflow history list is only present in a site if there is at least one workflow configured. If it’s not present in your site – it will be created with your first workflow. All subsites has it’s own workflow history list. Browse to your list by its “displayname” – Workflow History for a english site (it’s hidden from browser’s and do not display in “View all site content”). When in doubt – use SharePoint designer to get the name of your list among the other lists in the “Lists-folder”. wsBaseUrl = L_Menu_BaseUrl + ‘/_vti_bin/’; // Set the path to the webservice "lists.asmx"
// Is there history already logged on this GUID? WriteLogg(); // Call the script – the rest of the function "ExpGroupRenderData" is a unmodified SharePoint function from the file "BFORM.JS"
I just can’t extract the interaction.js and stringBuffer.js scripts from the word-file. Can I find these files somewhere else or could you send me an email with these two files? The script is in another file, the codeplex site has been rearranged and the default download is the documentation. Click “View all downloads” and select the file “SPJsLib.zip”. Thanks alot! I simply didn’t see it. I tried you solution and I didn’t got a result. 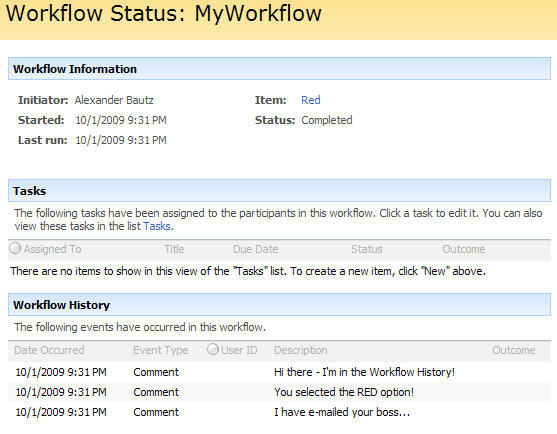 I’m using 3 workflows on My List and I have a several content types. So I don’t know if this can work with my custom list or not. When I tried to debug the code “WorkflowHistoryListVeiw.js” I always get res.count=0; so it will never work, however I have many items on the Workflow History” list. Please can you help me; and what’s function can I call to make it working. I have used your code and added some more code to get the Tasks status and show in the list Column, Assigned,Not Started, In Progress, Deffered, Completed and Waiting for one else instead of Inprogress and Completed.